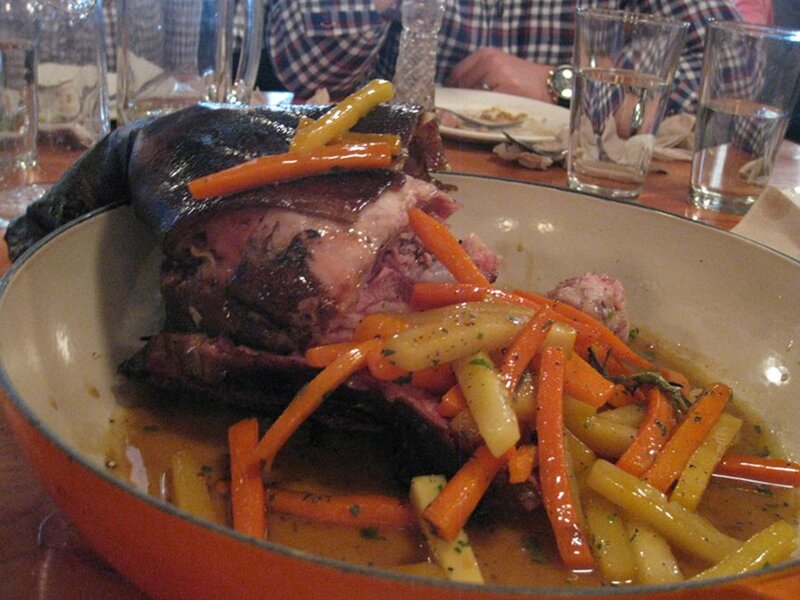 Now if you’re not familiar with the Pied de Cochon cabane à sucre, it is the most sought after venue that I know of. People reserve months in advance and by months I mean that by September you may be too late. This cabane à sucre is a foodies dream. They take classic cabane à sucre dishes and add new twists and refinement you would never expect. I had the good fortune of going a year ago and never thought I would be able to try it again, but I was lucky and here is a sneak peak of what you can get. Before I begin I need to warn you that you may get lost going here. In fact, Google maps is off in its estimates so just keep going until you see the Jon Deer depot and it will be on your left very soon after that, no matter what maps and GPS say, so keep that in mind. With a fixed price of $54 right off the bat you know it will be more than your normal $20-$25 cabane à sucre. There will not be any clowns, nor will there be endless refills on the dishes. Coffee is not included and will run you $2.25 but you do get free refills and a small cider is $6. Also, if you want a tortière, it’s $20 for one which can be much if you are a small group but we were 10 and that tortière is quite large and can go a very long way. So, with all these little extras you can assume that your bill will grow to the $70 ranges once taxes tips and extras add up. The tortière was amazing! 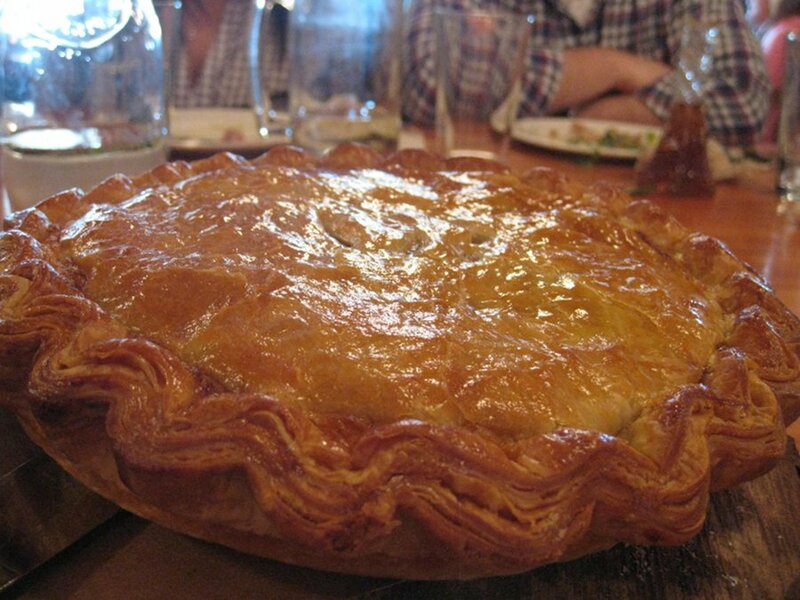 It is loaded with meaty goodness and has a nice crust and the presentation is impressive. This is a nice dish to have since it is very filling and if you want to, you can buy one to go as well. The opening course consisted of a culinary onslaught of dishes they hit us hard with multiple dishes one after another. Oyster, soup, and salad greeted us in the early rounds. The oysters came on a bed of salt on top of piece of wood kind of like a slice from a tree trunk. 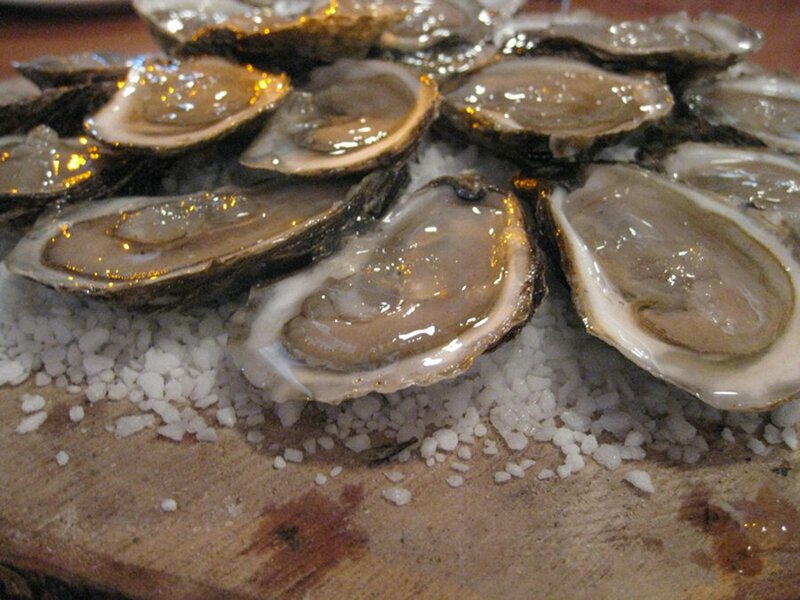 The oysters were quite tasty and although some people are hesitant to have them, I jumped right in. They were a nice touch and brought some definite refinement to the whole meal. The soup had chunks of foie gras in it. Foie gras is the staple ingredient in the pied de cochon menu and I could not get enough of this soup; it was warm and tasty; a real treat. Their salad was no ordinary salad. If you thought you were going to get a vegetarian option here, think again. 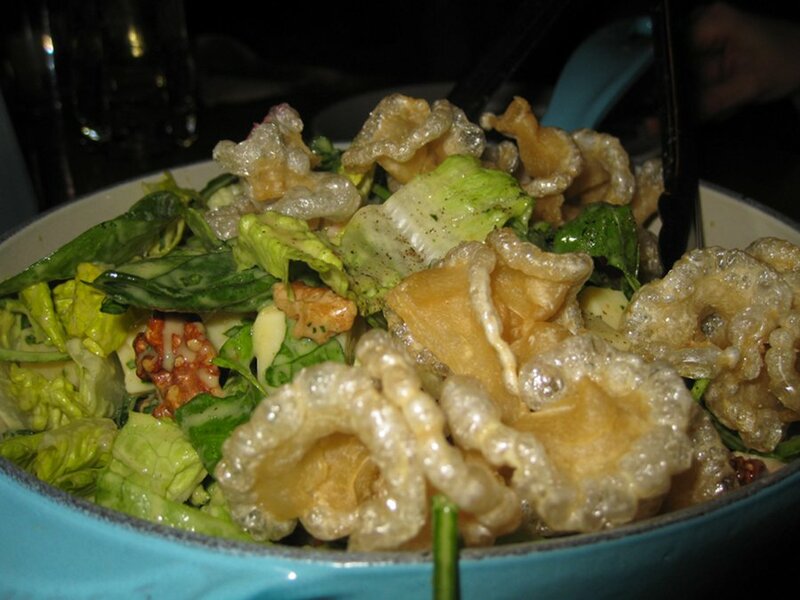 The salad had cubes of ham and a tempura syle Oreille de crisse. (commonly known as pork rhinds). Normally, oreille de crisse (which literally means christ’s ears) are really salty and hard as a brick. I pride myself on being able to eat any meat out there but Oreille de crises is my limit as they tend to be so salty and hard that rarely have I had an adequate one. This time, however, they did something to them where they looked as if they have been put in a tempura batter and are not overly salty. I think this was the first time I truly enjoyed them. The salad was amazing and I ended up having 3 plates of it. The ham was a nice idea and the dressing was very tasty and not overpowering. I think you could see how happy I was by their spectacular job on the Oreille de crises. 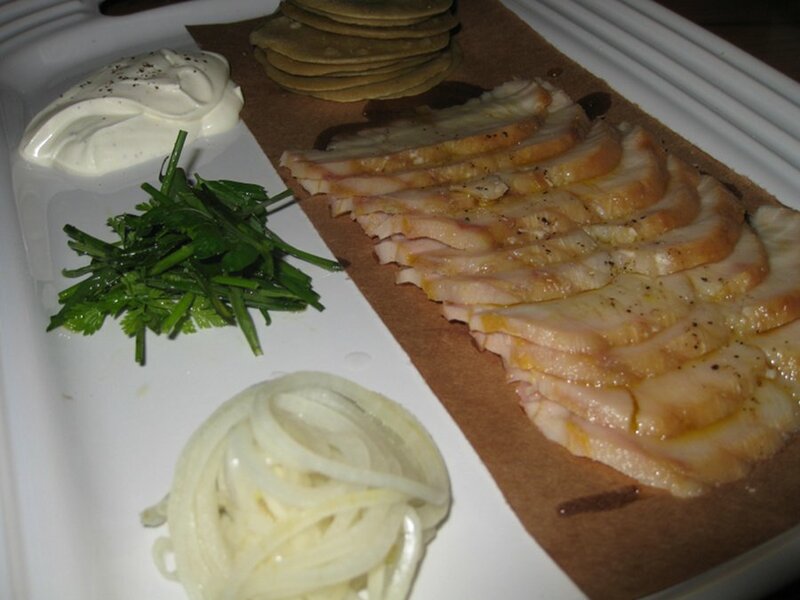 Next came a dish with blintzes, pork, sour cream and onions. The meat was juicy and the blintzes were a nice touch. This kind of kept us interested as the big guns were getting ready and we also got a sushi plate which had a partial tempura batter outside. To be honest these two dishes, although good, were the weakest in the line-up. 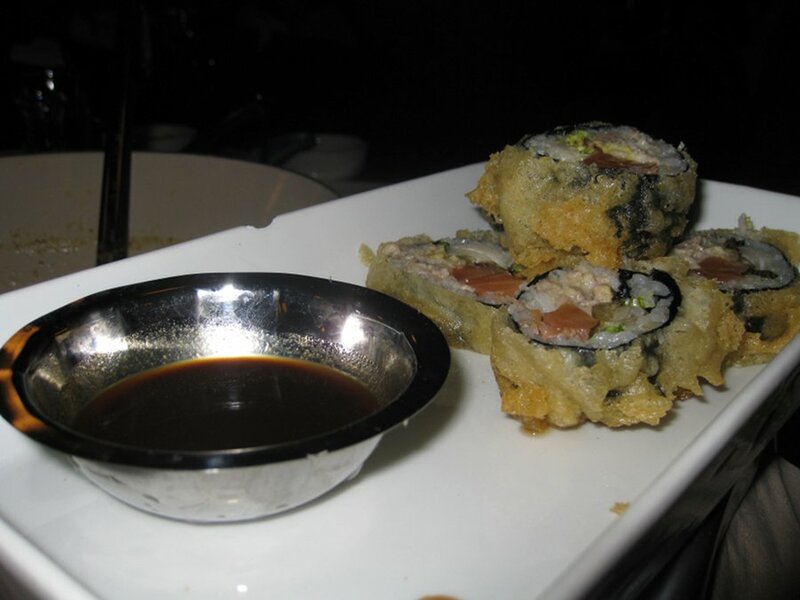 Don’t get me wrong: these dishes were good and having sushi is a really nice touch which you would not expect to get at a cabane a sucre. Finally, the big guns came out. This is where you loosen your belt or hope you’re wearing something with an elastic waste band. They brought the tortiere which we paid an extra 20$ for and it was worth it. This dish is not really needed considering how much food you get but it is nice little extra. They brought us a giant lobster omelette. 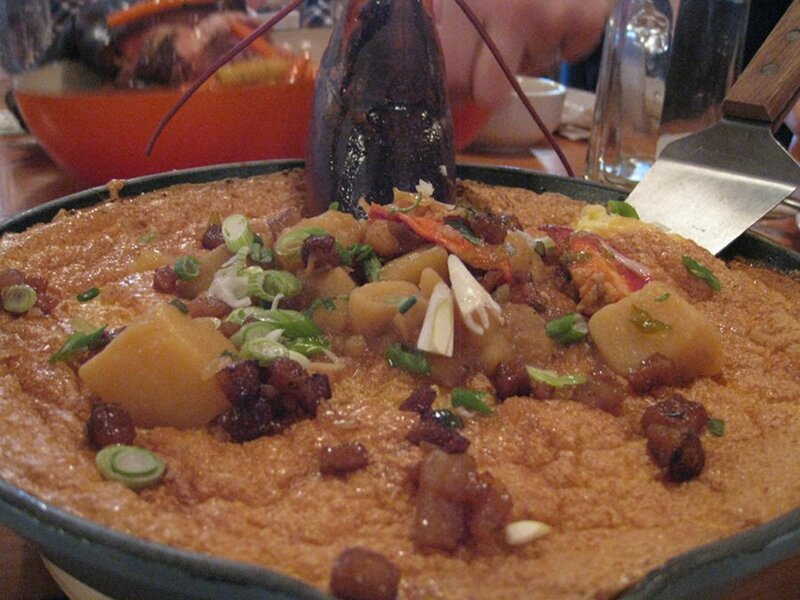 This bad boy was deep and jammed with eggs, potatoes and chunks of lobster. In fact, they put a hollowed out lobster on the top in case it wasn’t clear. The dish is very heavy and truly filling. Although, I did feel that I did not get all that lobster taste. In the two slices I got out of it, one did not have any pronounced lobster taste while the other did have a good sized lobster chunk but the omelette taste overpowered the whole thing. After the lobster, came the quail which was with two of its other quail friends all glistening and warm and, oh yeah, delicious. This is one kind of meat that I did not expect on the table since cabane à sucre meat is usually focused around pork. I liked having this as it wasn’t too greasy and was still moist and tasty. 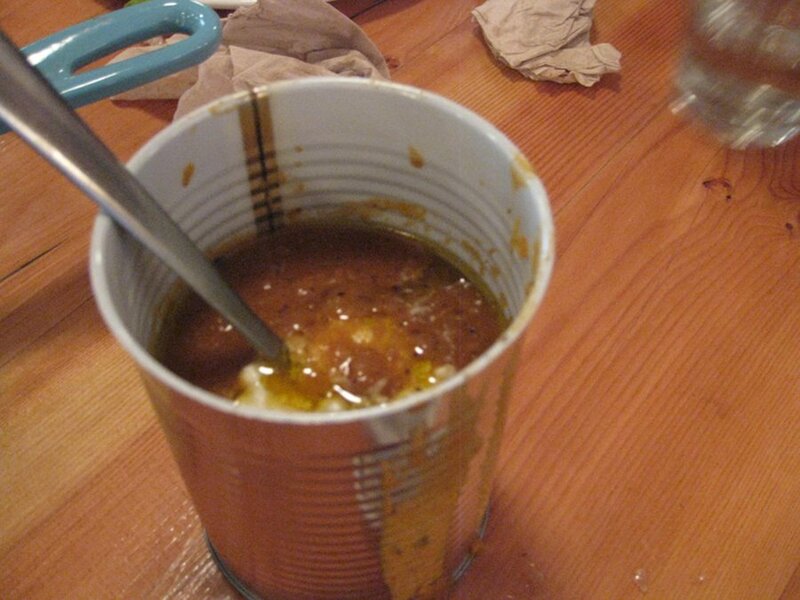 This dish was accompanied by beans in a can. I loved the presentation and the beans were bursting with taste and even though you knew that these were so not good for you but you couldn’t hold back because the taste delivered with every bite. One of my favourite dishes followed suit: the leg of pork with vegetables. This giant piece of meat stuck out of the pot and was moist and juicy. It had this kind of glaze on it and when you bit into it you were taken on a trip to a land where delicious lives. When I think back about how moist, tasty and impressive it was, I want to go back and get another helping. Needless to say, this dish disappeared very quickly and was a hit at the table. The vegetables were also good but to be honest, they didn’t stand a chance next to the main dish and now that I think of it, I don’t even remember eating them. Just when you think you can’t possibly eat any more, the waiter brings out the dessert and not just one, but four options. 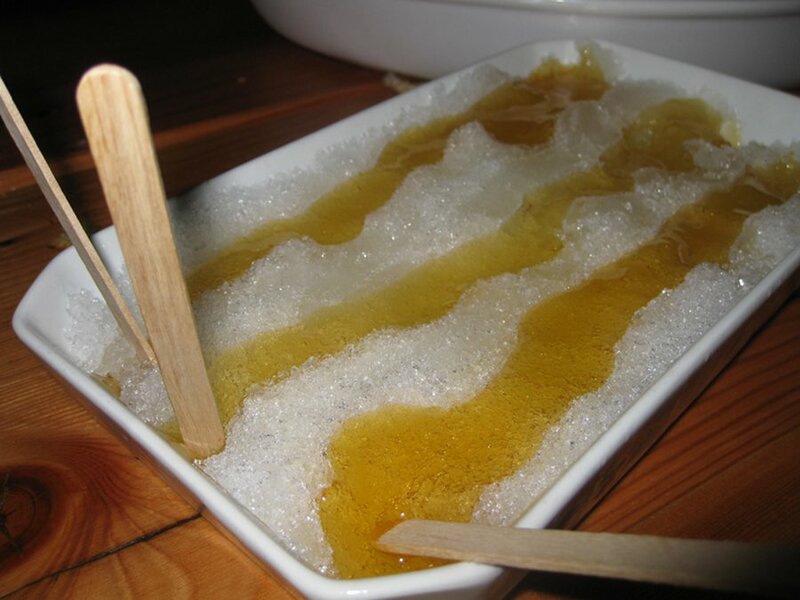 You get your traditional tire, which is maple syrup on snow with a popsicle stick so you can roll it up. The catch with this plate is that you need to move fast or else the consistency of the maple syrup breaks down and it melts with the snow and is not nearly as fun or delicious. There were also these deep fried round pieces of dough similar to a beaver tail but smaller and more fried (if such a thing is possible). They were very tasty and quite likely not good for your heart but we pretty much stopped caring about that the minute we walked in. 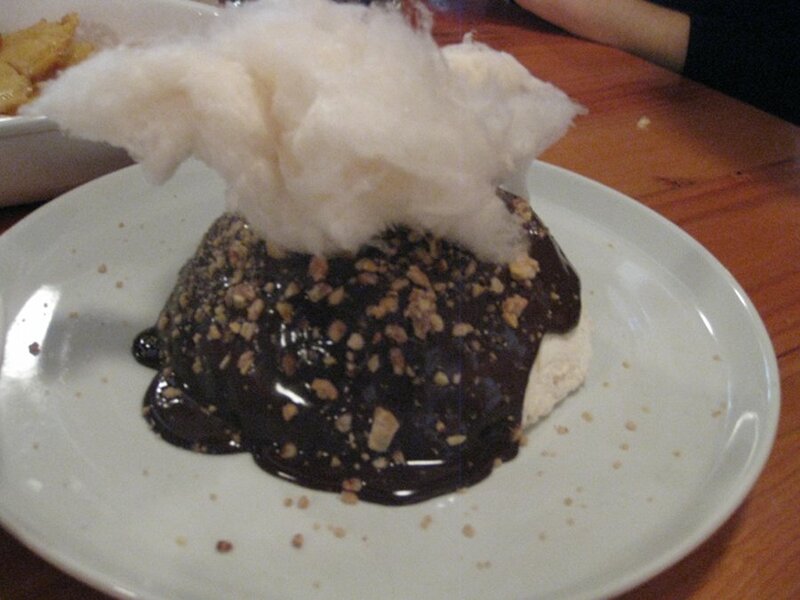 The pie and ice cream topped with a chocolate dome and cotton candy on top was another option. I honestly don’t remember what was in the pie. I think it was either apple or peach but I was slipping into a food coma at this point. I do recall the ice cream dessert which was quite interesting with the cotton candy which is a fun way to add a little extra to ice cream. I had a variation of this last year when I went and I remember enjoying it then as well. Service was very good the dishes blazed onto our table and drinks were brought quickly. Sometimes catching our waitress was tricky since they were swamped with people and were always running around. There is not a single vegetarian dish here except for dessert and I bet you somewhere in there is some meat. Even the salad had two types of meat not just one. Vegetarians beware: you are not welcome here! Cabane à sucre, in general, is not vegetarian friendly but this one even more so don’t even think about it unless you want to watch other people eat meat. This might just be the type of place that converts people into vegetarians. 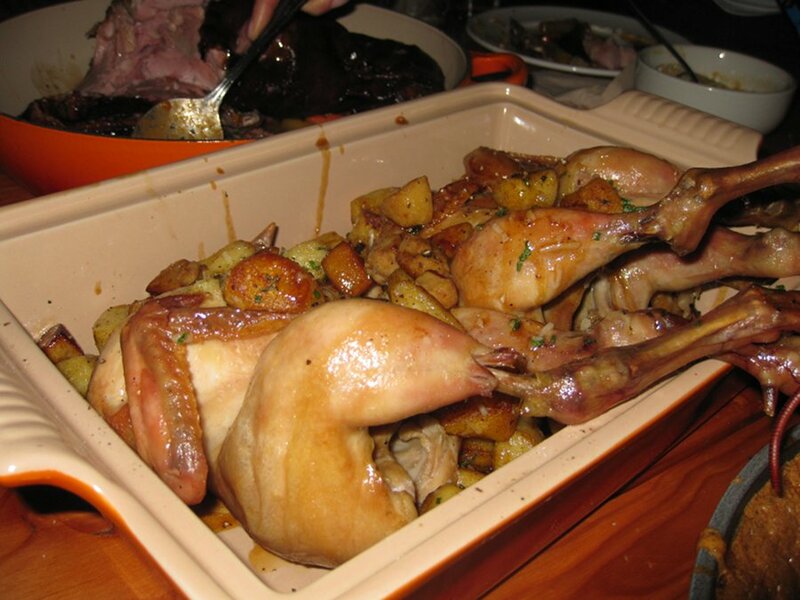 Pied de cochon cabane à scure is an experience to be had. It is not cheap, with your base price at $54 and that is likely to increase as you add extras and pay taxes with a tip. If you have the budget and can get reservations then you will love it. This is feast unlike any other: they took your run-of-the-mill cabane à sucre and turned it into a foodies dream. I really enjoyed reading your review. 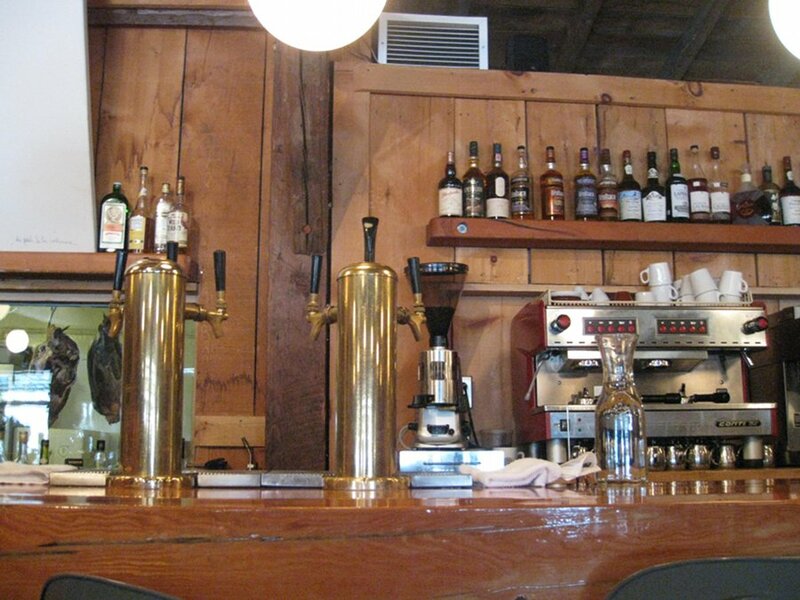 My Gf and I have been pining for a trip to the Pied de cochon Cabane à Sucre for a while now, but have not had the chance to go yet. Your descriptions were really evocative. I really hope I can go next year. Should we go as a group? Can couples go there and enjoy the experience or should I start convincing some friends now? I would suggest a group, you can split the toritiere and its more fun as well as sharing your meal items. The tables can accommodate groups of almost any size.